This beautiful rustic mahogany leather belt is handmade in the USA from genuine full grain cowhide leather - the very best grade that we personally hand select from local suppliers. This leather has all the natural imperfections and textures that make each belt different from the next. We hand cut, hand dye, design, sew and finish the leather in our shop. We will also flawlessly embroider the belt with an initial on the buckle for FREE, great for gift giving. This is a classic belt meant to last for a long time. 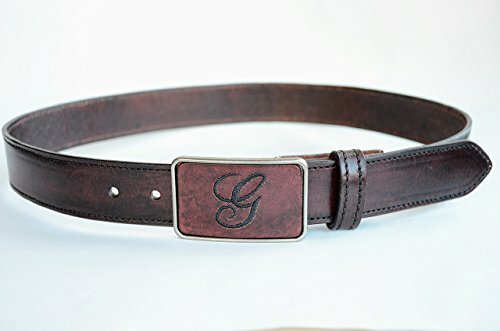 >>>>>>>>>> FEATURES: - Hand dyed genuine full grain cowhide leather - Stitching line around the belt perimeter - Carefully burnished and waxed edges for stylish and elegant look - Sealed with a water resistant finish (but please always keep the belt away from water to preserve quality) - The Buckle is removable - 5 hole sizing. >>>>>>>>>> TO CHOOSE BELT SIZE: Add 2 inches to your pant size. For example, If your pant or waist size is 30 inches, you'll need to purchase a 32 belt size OR follow the quick instructions listed in the last photo above. >>>>>>>>>> Please note that leather is a natural product and is subject to variations. This can affect how it absorbs the dyes. This can result in slight variations in color from the listing pictures. >>>>>>>>>> If you have any questions about this belt, contact us and we will get back to you within 24 hours or less. Thanks for shopping at Urban Krafts! If you have any questions about this product by UrbanKrafts, contact us by completing and submitting the form below. If you are looking for a specif part number, please include it with your message.